Let’s face it. Red Lobster has the BEST cheddar biscuits on the planet. Even after weight loss surgery, I can eat far too many of those tender delights. I’m convinced that when we all get to heaven and God serves dinner, Cheddar Bay biscuits are going to be on the menu. Here is my version of the finished product, fresh from the oven! Since I can’t afford to eat at Red Lobster every day, I started the quest to make the perfect clone of their biscuits. It’s taken me several years to figure out how to make these, not that we’ve minded experimenting too much. Tonight, I think I finally got it just right. The basic dough is a combination of the ‘Popeye’s Biscuits’ recipe from the book “Cajun Cookin’ Too” by Maw Maw Judice, and the master biscuit mix recipe from the “More-with-Less” cookbook by Doris Janzen Longacre. You might be able to pick up a copy of Maw Maw’s book by ordering it from Larry’s French Market. If you enjoy Cajun food, you’ll love her cookbook. I added the additional ingredients after experimenting and looking at the countless clone recipes out here on the internet. First, you need to have biscuit mix. 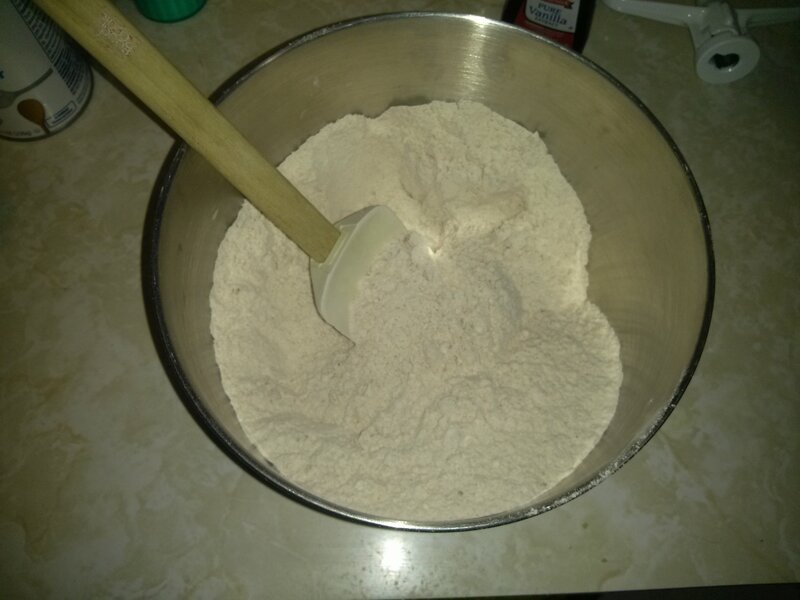 You can use Jiffy mix or Bisquick, but since our family has had to work around dairy and soy allergies, I got used to making my own homemade biscuit mix. Here is the recipe I used for the biscuit mix. It makes 4 pounds–more than enough for the biscuits and enough left over to make a bunch of pancakes and biscuits another time. You’ll need a very large bowl or a larger stand mixer for this. If you have a regular sized stand mixer, you may need to cut the recipe in half to fit the bowl. I let the stand mixer do the work. If you want it more milk-flavored, add in 2 c. dry milk powder, but it’s not required. I didn’t include it, and I think the biscuits came out more tender without it. The mix can be stored in an air-tight container at room temperature. Maw Maw Judice’s Popeye’s Biscuit recipe is very tender, just like the ones in the namesake restaurant. When I realized those biscuits had the same buttery flavor and melt-in-your-mouth texture, I knew I’d found my base. From there, it was a matter of adjusting seasonings. Cheddar Bay biscuits have a combo of several things: Cheddar cheese, Old Bay seasoning, and lots and lots of garlicky-tasting butter on top. 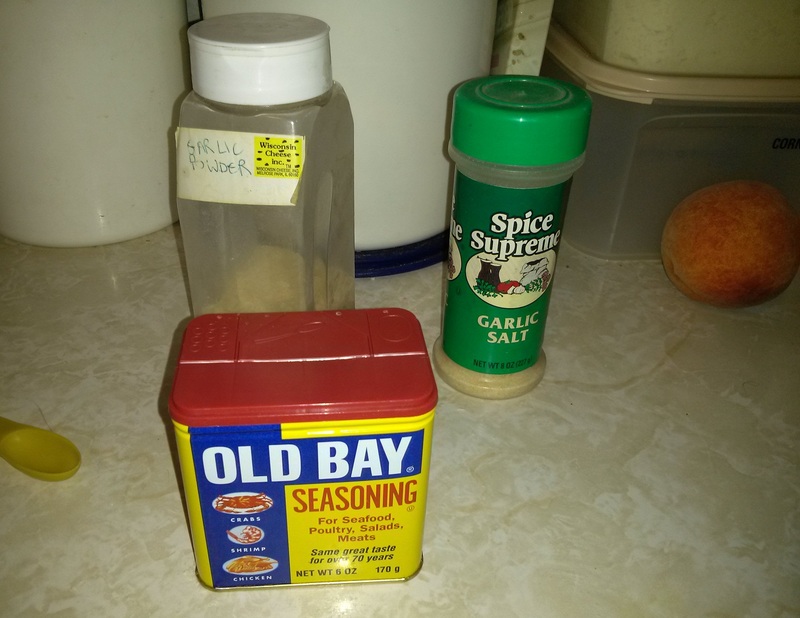 If you don’t have Old Bay seasoning, you can order it from the Old Bay company here, or you can make a version of your own. There are many copycat recipes on the net. Cheddar bay biscuit seasonings include garlic powder, garlic salt, and Old Bay seasoning mix. No, peaches are not involved. 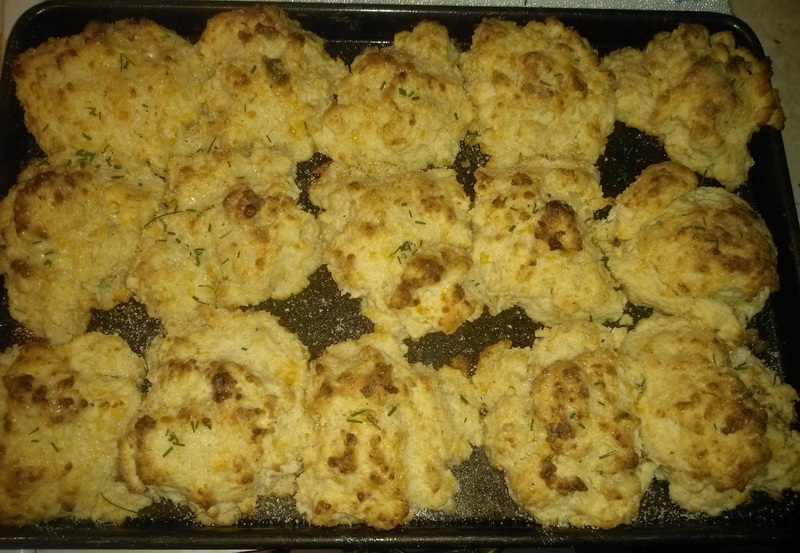 Here’s the recipe for Jae’s Cheddar Bay Biscuits. 8 oz. sour cream (1 c.). Don’t go low-fat here unless you absolutely, positively have to. You need the appropriate fat to keep the biscuits tender. 1 stick (1/2 c.) butter, divided and melted. Melt the butter, and pour half of it onto a cookie sheet. Spread it around with a brush. 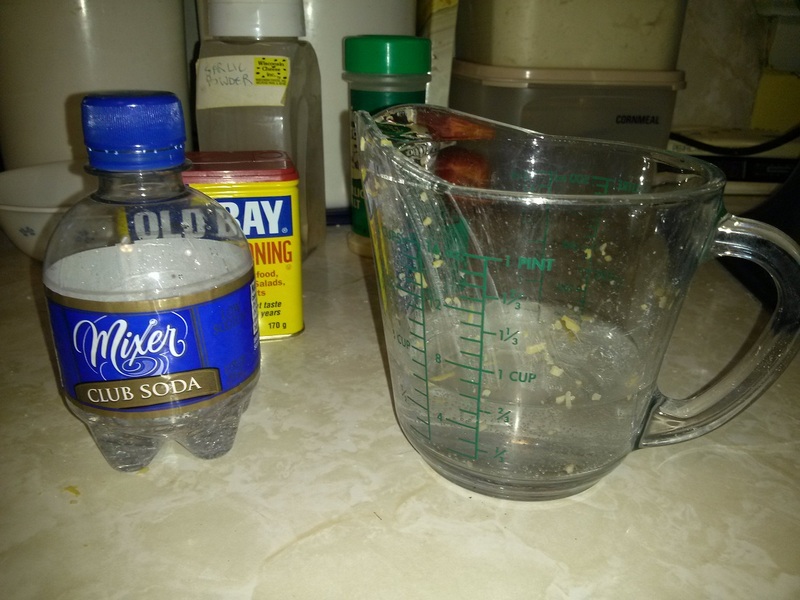 Here is the mix before adding the club soda and sour cream. 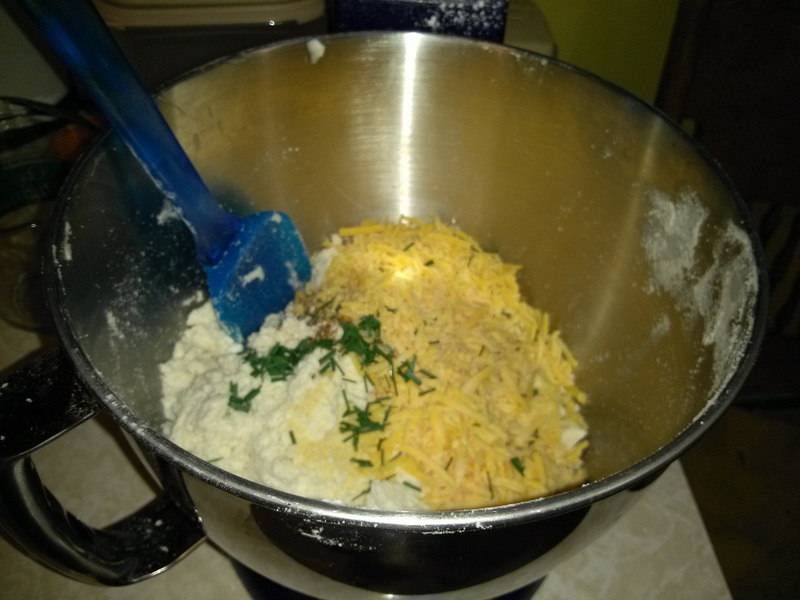 In a large bowl, mix together the biscuit mix, Old Bay seasoning, garlic powder, chives or parsley, and cheese. Add the club soda and sour cream, and mix just until blended. Don’t overmix! Yes, you really do use club soda in this recipe. The biscuit dough will look like this when it’s just mixed together. It will be lumpy, and that’s OK! Drop large spoonfuls onto the prepared cookie sheet. Bake 13-15 minutes, or until just brown on top. I only baked mine 13 minutes. When finished baking, brush the tops with the rest of the melted butter, and sprinkle with some more chopped chives or parsley flakes. Lightly sprinkle garlic salt on top–don’t overdo it or they’ll taste too salty. If you only have garlic powder, sprinkle that on top but then sprinkle on a bit of table salt as well. Garlic powder won’t cut it alone–it needs that bit of salt to give it the correct flavor. Enjoy! I won’t tell you not to eat too many when I can’t follow that advice myself! How to Make Zucchini Bread! Zucchini plants come in two flavors. Over-productive, and ‘OMG-what-do-I-do-with-them-all’ over-productive. I discovered this when I was still in college and rented a community garden plot. I planted five hills of zucchini seeds, following the instructions on the seed packet explicitly. My theory was that two of the hills might not make it, and I would only get about two zucchini per plant. This would leave me some to make zucchini bread, and some to give away to friends. This obviously was in my ‘garden-naive’ days. That year happened to be a fantastic year for zucchini. All five plants survived and soon began breeding faster than rabbits. By the end of summer, Trusty Hubby was looking around for open car windows so that he could leave bags of zucchini on the front seats. When we finally got the first hard frost, I think he danced a jig on the poor dead squash plants. Yummy zucchini bread waiting to be eaten! This summer, I naturally decided five hills might be overkill. Therefore, I only planted four hills. Again, this was on the theory that two plants would die. Only one died, mostly because I ignored the seed packet instructions and planted them a little too closely together. The three biggest ones exploded in growth so quickly that the fourth one died from lack of sun under the others’ leaves. I am now the proud mother of approximately 15 zucchini in two weeks, some of which have grown huge. By ‘huge’, I mean ‘they could be mistaken for Godzilla if they happened to fall on Tokyo.’ I told one of my friends who also grows zucchini that God had taken the 2-inch long ones I had the night before and replaced them the next morning with ones the size of mannequin arms. We agreed that if you cut them in half and add a nuclear motor and propeller, they could make outstanding substitutes for aircraft carriers. This might save the Navy considerable money. 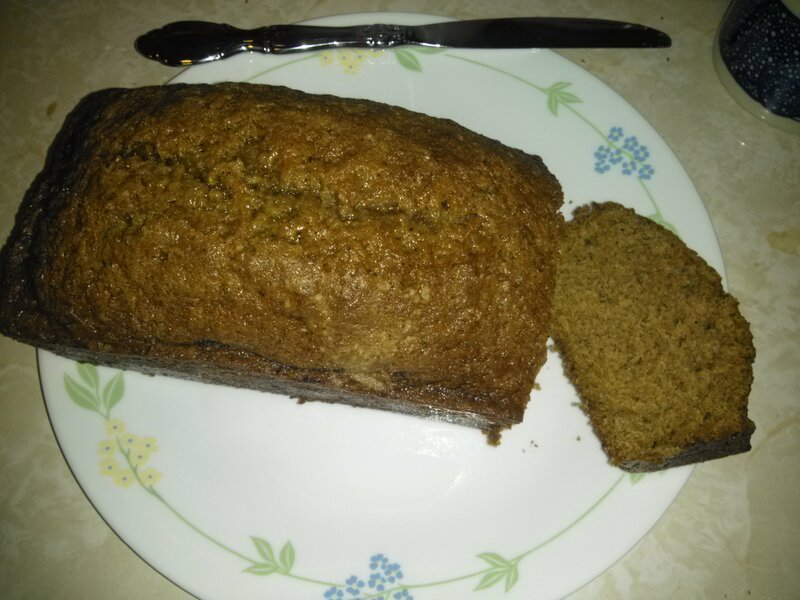 One of the larger zucchini’s destiny was to be shredded and baked into yummy zucchini bread. Small zucchini are fantastic for sauteing. When you catch them in their pre-puberty stage, they haven’t developed seeds, and they’re still very tender and yummy. The large ones have grown tougher and have lots of seeds that need to be scooped out. They do shred very nicely, however. I thought I would share with you a little tutorial on how to make zucchini bread, complete with recipe. Note that this is not in the least low-fat. You’ve been warned. However, the fact that it’s made with a veggie makes up a bit for it. The first thing to do is select a nice ripe zucchini and wash it up. Then, preheat your oven to 325 degrees and spray two 8×4 loaf pans with cooking spray. The larger loaf pans also work well. 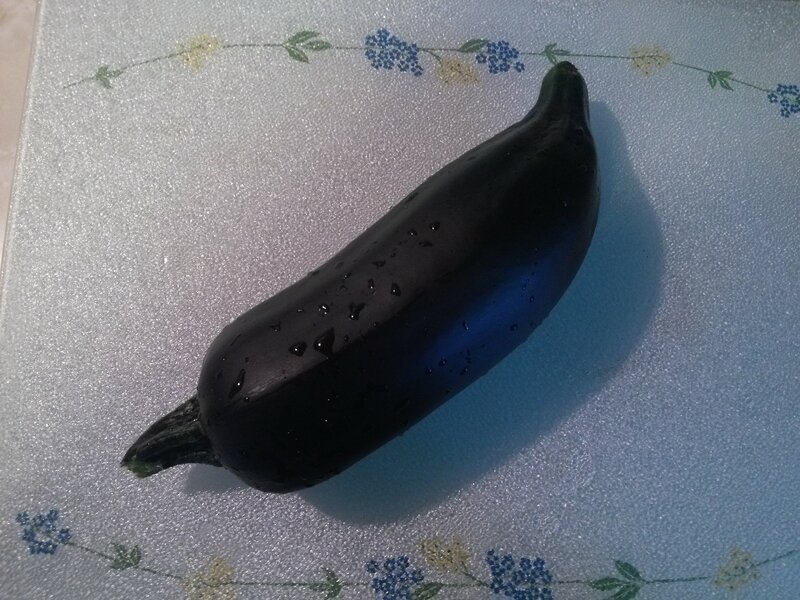 Here’s a firm, dark green zucchini, ready for its future as bread. Next, cut off the stem (we don’t need that kind of fiber in our diet) and the end where the flower was, and then cut it in half so that you can scoop out the seeds. This zucchini is probably a little short to be useful as an airplane landing strip. Once you’ve scooped out the seeds, shred it. You can use a hand shredder, but I prefer to use my Cuisinart. I use the fine-shred blade. 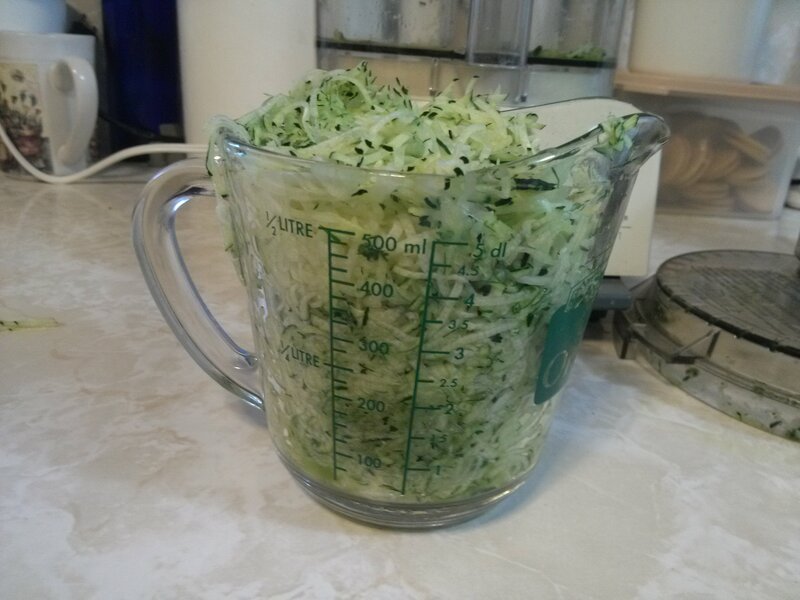 A food processor makes quick work of shredding zucchini. You might have to empty the food processor bowl if it gets too full. You’ll need about two cups of shredded zucchini to make the bread. If it goes over the 2-cup mark a little bit, that’s OK. Don’t drain the zucchini–that moisture is what helps keep the bread tender. 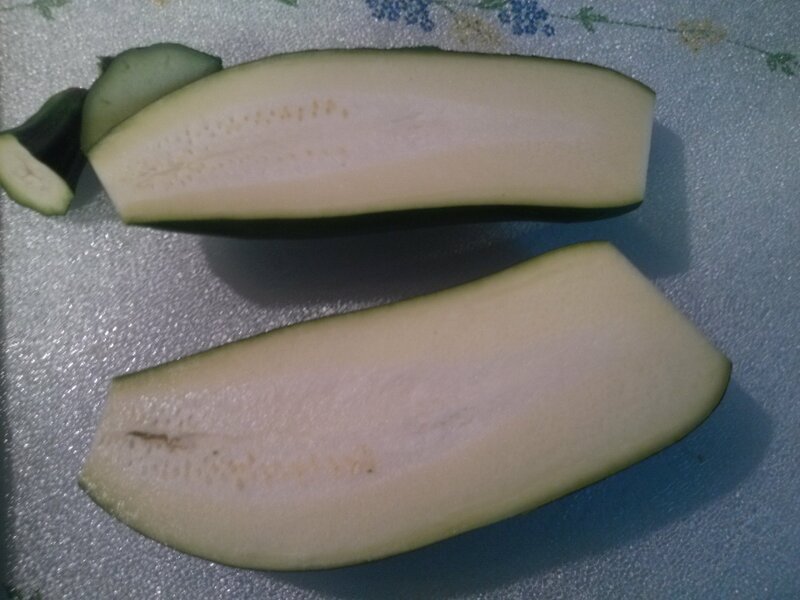 Two cups of zucchini shreds out of one zucchini-not bad! In a medium-sized bowl, mix together the flour, salt, baking soda, baking powder, cinnamon, and nutmeg. Set that aside. 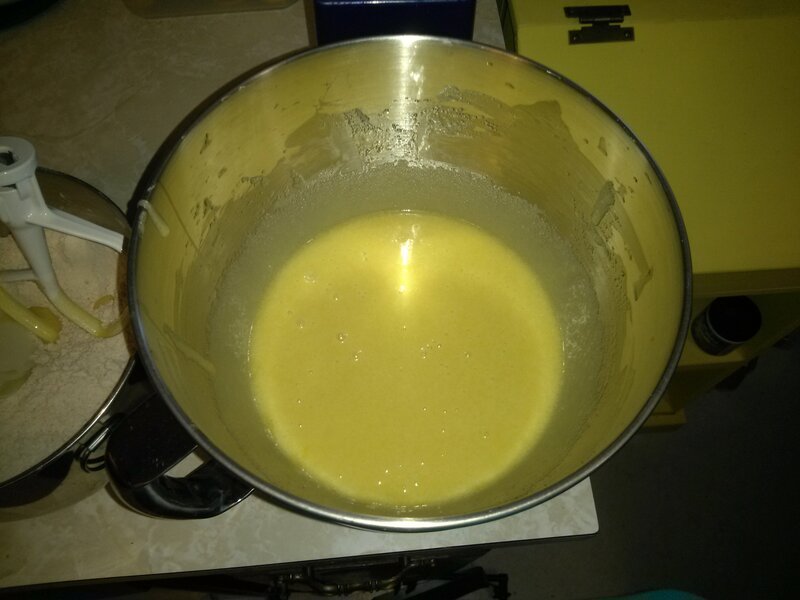 …and after blending the flour mix together. Next, pull out a large bowl. Mix the oil and sugar together until smooth. Then add the eggs and extracts. Beat the mixture until it’s a nice light yellow. 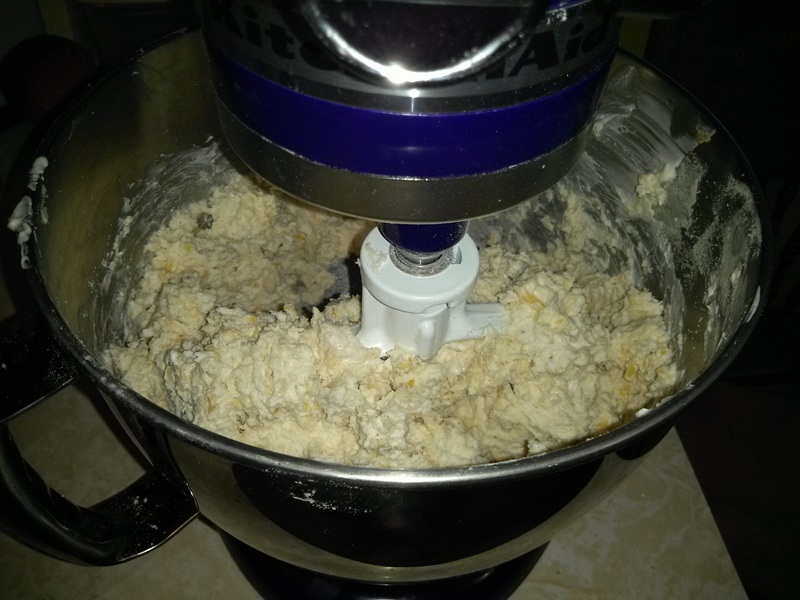 I let the stand mixer do the beating for me, but you can use an electric hand mixer or do it by hand. 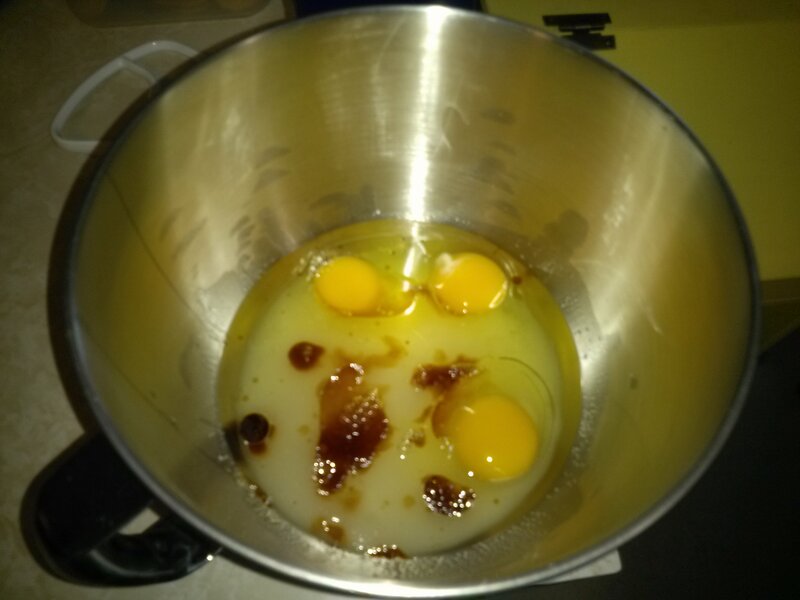 Here’s what the mix looks like before beating together, complete with the vanilla and eggs. This is what the egg mix will look like once it’s well-beaten. It will be a nice, light, creamy yellow color. Then, pour the flour mix in and blend. 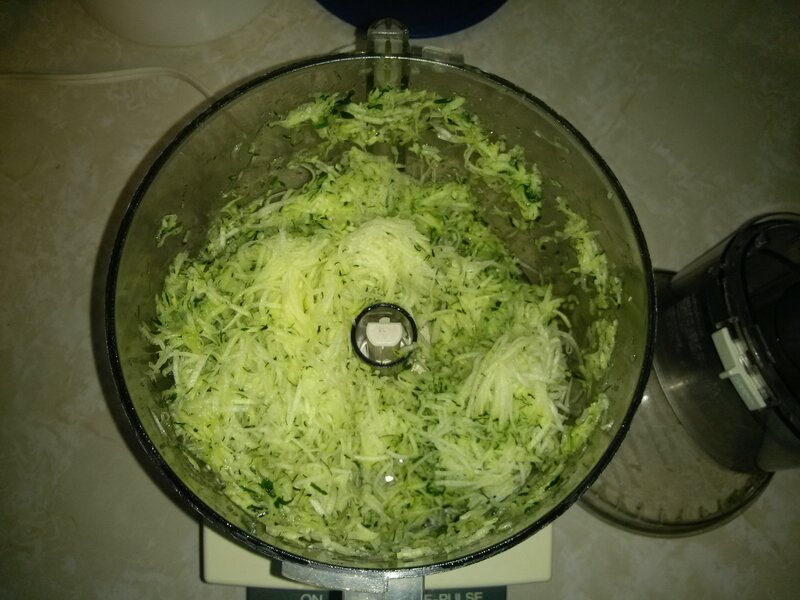 Once it’s nice and even, and most of the lumps are gone, dump in the shredded zucchini. Add the nuts at this point, too, if you happen to like those. Mix in completely, but don’t beat the snot out of the batter. 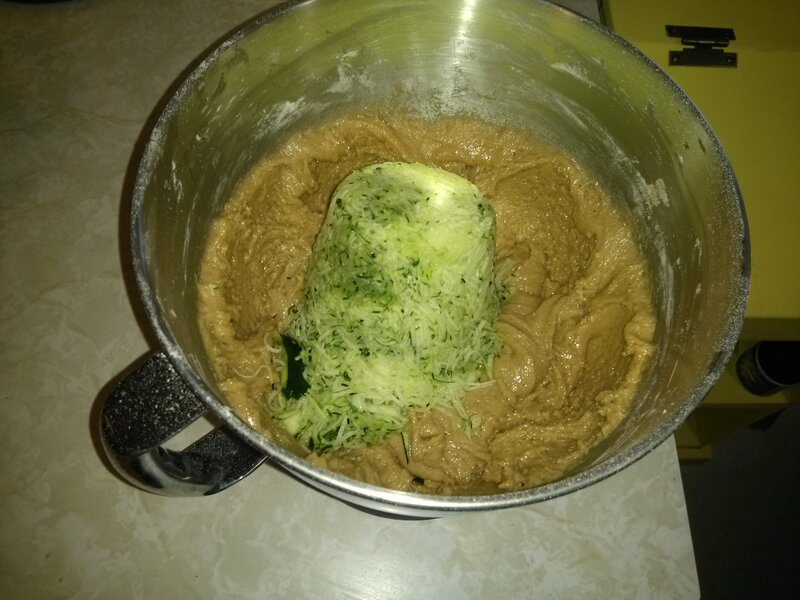 Add the zucchini to the batter, and mix until just blended together. Pour the batter into your pans that you’ve already sprayed with cooking spray. 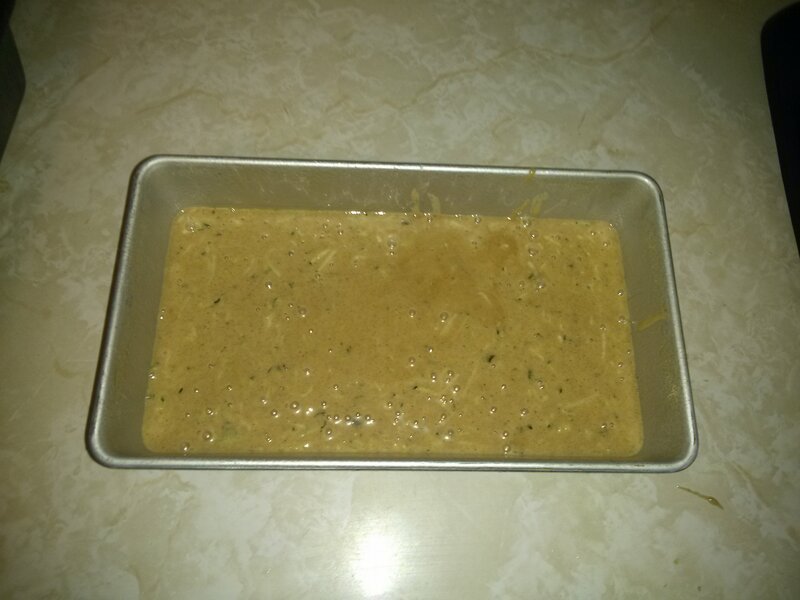 Fill the loaf pan about half to two-thirds full of batter. Bake it for 45-60 minutes, or until a toothpick or tester inserted into the center of the bread comes out clean. Smaller loaf pans will take less time than the larger loaf pans. When done, cool the loaves in the pan on a rack for about 20 minutes. Then, remove the bread from the pan, set the loaves back on the rack, and let them finish cooling. Make sure they’re not in reach of any pets. My dog has gulped down an entire loaf at one time because I left it too close to the counter edge. 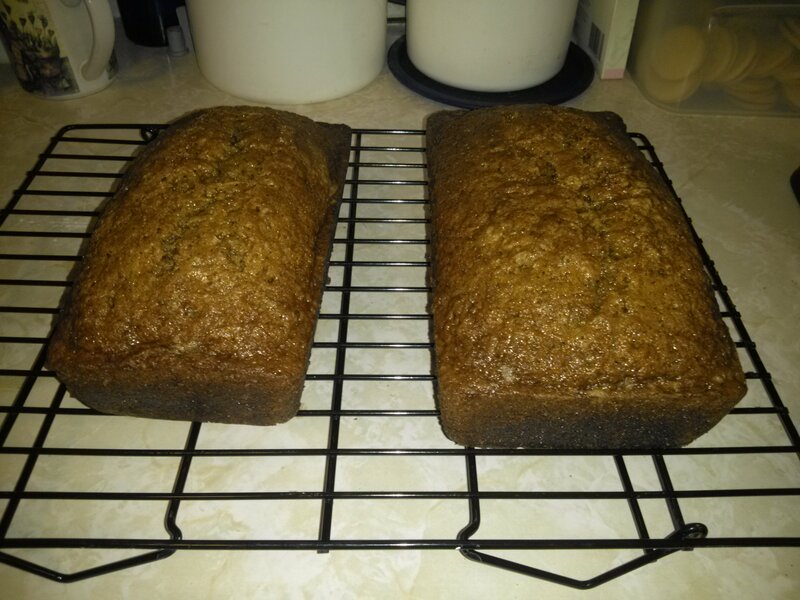 Cooling zucchini loaves. Can you wait long enough before slicing it? Once the loaves have cooled, you’ll be able to slice them more easily. However, I usually can’t wait that long. Melted butter on a hot slice of zucchini bread is heaven. Spray two 8 x 4 inch loaf pans with cooking spray. 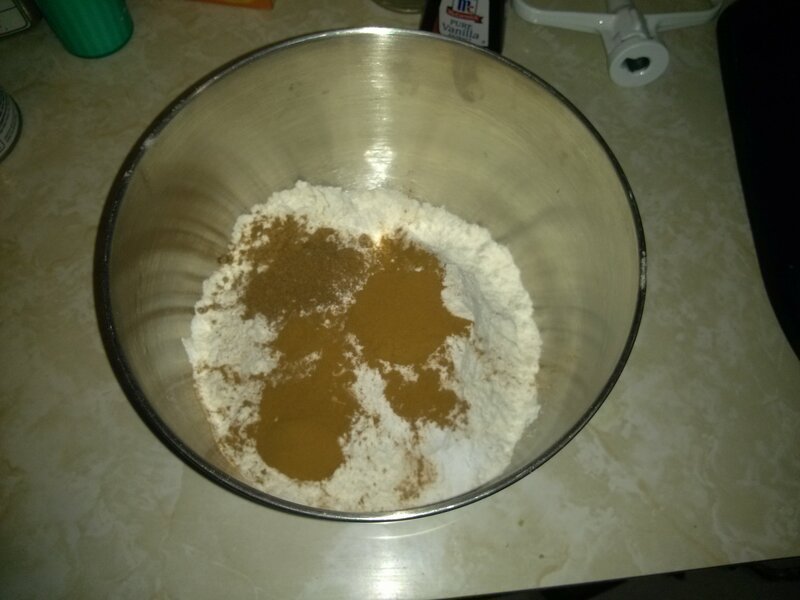 Mix flour, salt, baking powder, soda, nutmeg, and cinnamon together in a bowl. Beat eggs, oil, vanilla, and sugar together in a large bowl. Add the flour mix to the creamed mixture, and beat well. Stir in zucchini and nuts until well combined. Pour batter into prepared pans. Bake for 45 to 60 minutes, or until tester inserted in the center comes out clean. Cool in pan on rack for 20 minutes. Remove bread from pan, and let cool completely on the rack. Enjoy one of the quintessential tastes of summer! If you have extra zucchini, you can shred them up and store them in freezer bags. I usually measure out two cups into each bag. They will come out a bit mushy from the freezer, so they’re not really good for sauteing at that point, but they’re great for more zucchini bread, zucchini cake, or added to lasagna. Just remember not to drain them. If the frozen zucchini lasts til winter, you’ll have a nice reminder of your harvest just at the point when you have horrible spring fever and are contemplating the next summer’s garden plan. Feel free to leave comments and share your favorite ways to prepare zucchini!